You’ve heard me say many times that you don’t have to keep strict boundaries between outdoors and indoors. You can bring elements inside that might otherwise be considered strictly “outside,” like plant materials or design ideas. The same idea can work outside the four walls of your house; you can create ‘rooms’ of areas that were once unused, ignored, or simply walked through. 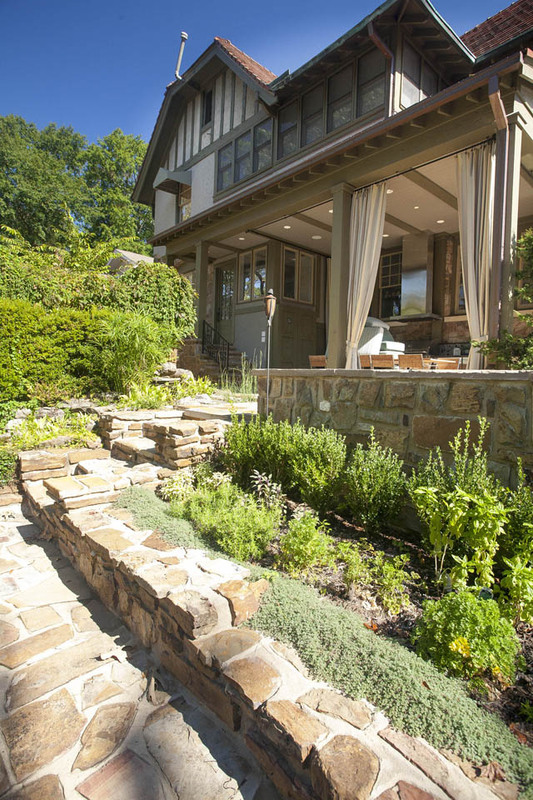 You can take a corner or any flat area of your landscape and make one–or many–rooms to enjoy. These photos are from a house where I did the plantings. 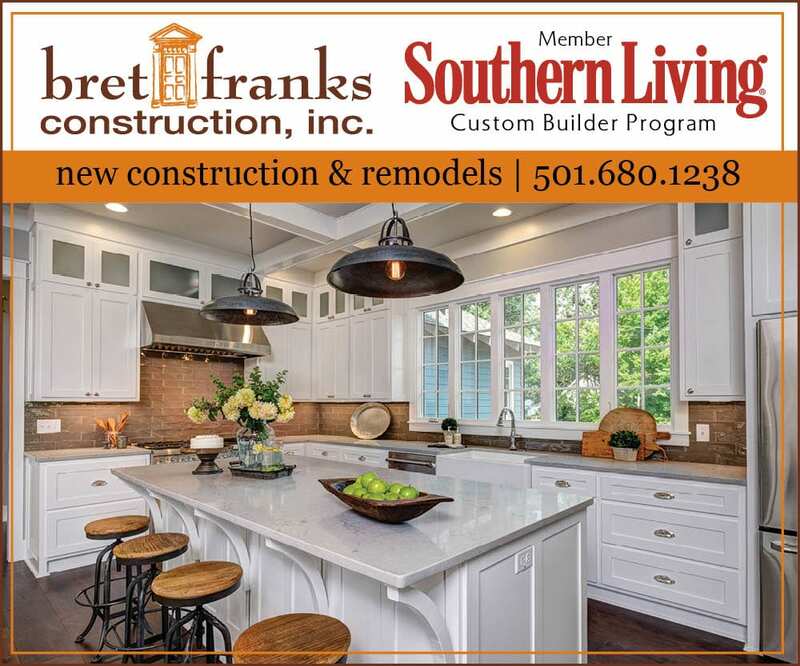 Garry Mertins and Kaki Hockersmith did the interiors. 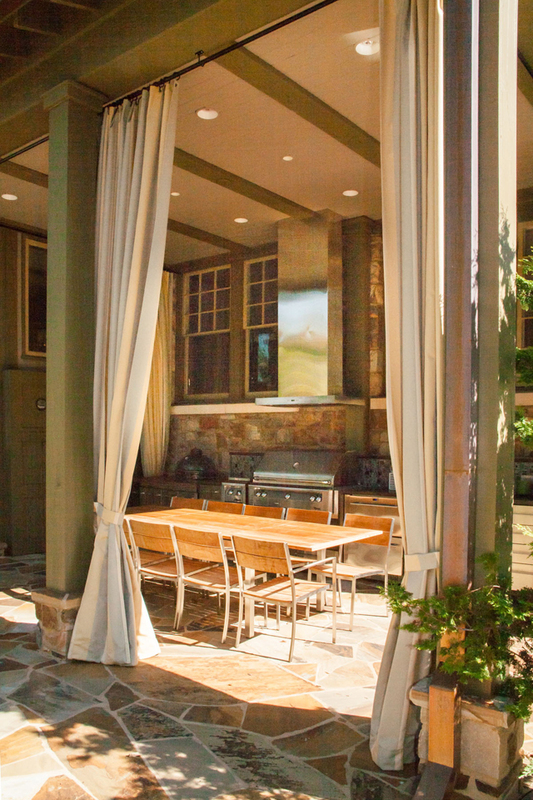 What you can see is how easy it is to create rooms out of doors, and create a whole new living and entertaining area. The best course to follow is simplicity. 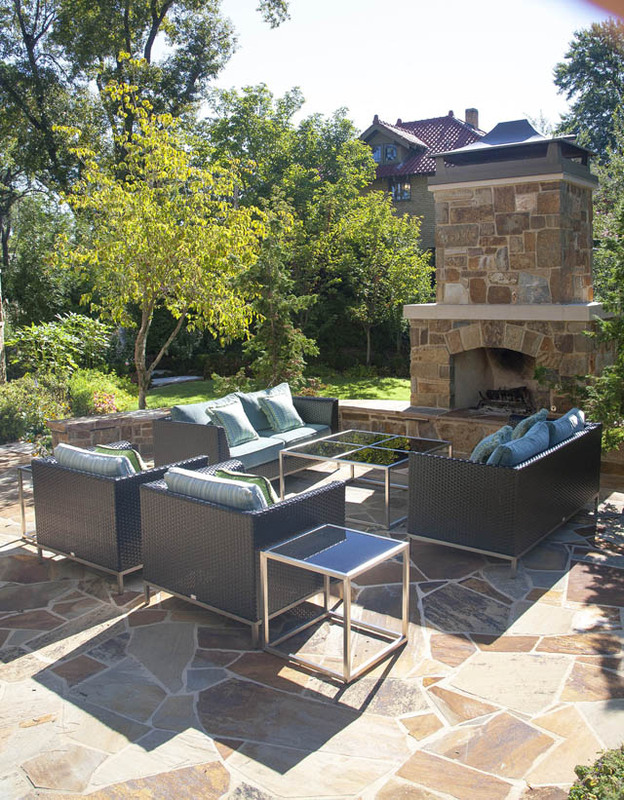 Arrange seating and tables at a focal point, like a fireplace, or fire pit. Another nod to simplicity: use furniture and tables that are functional and in hues that fit into the colors of your landscape. Busy patterns and hot colors won’t be necessary because you aren’t competing with your plantings as much as you are working within them. 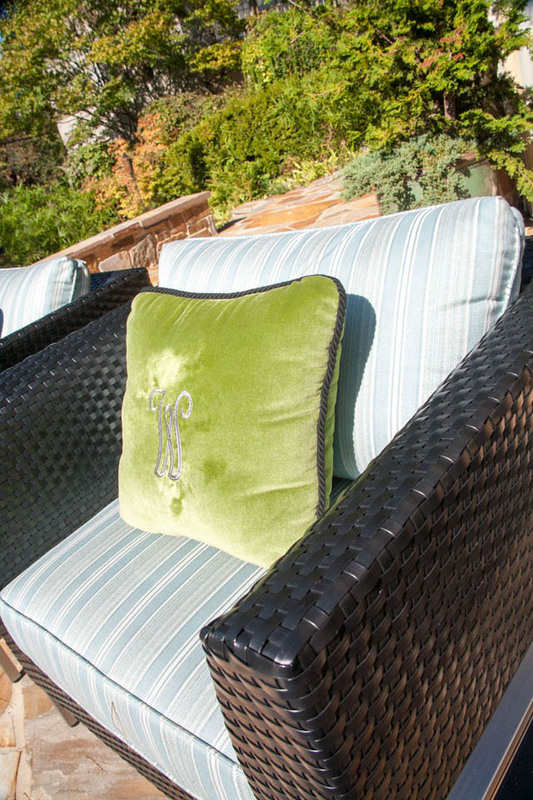 Greens, blues, and darker colors may be better for outdoor room furnishings. Notice how this arrangement mimics a chic angled room from the house. You haven’t reinvented the wheel, but you have rolled it outside. Once you’ve considered basic color use and seating that is both comfortable and functional, don’t forget the design elements of texture and light. Stone is your ally, so use it wherever you can. Ultimately it’s all about flow. 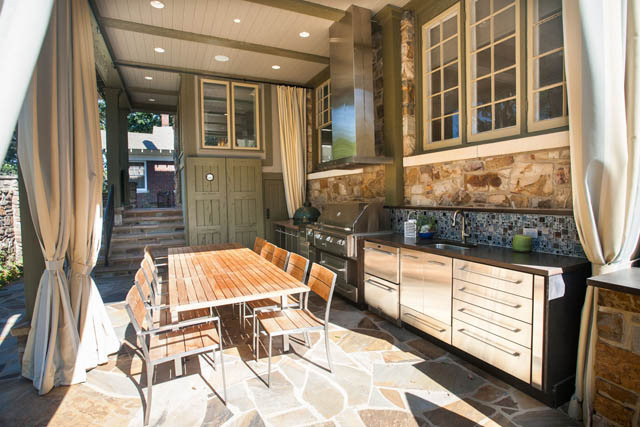 If you have enough room, why not create an outdoor kitchen and adjacent seating? 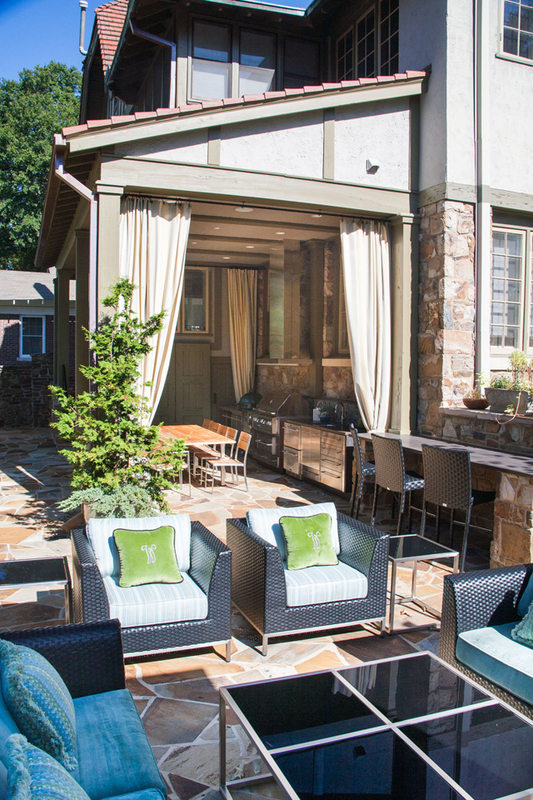 Your guests can stroll from room to room, chatting and drinking while enjoying the outdoor experience. A nice tall set of curtains provides shelter from the occasional rainstorm. Your guests won’t have to run for the house. The basic rule for a party is simple: guest congregate in the kitchen when they can. A working kitchen—with all the appliances just like the one inside—makes for great use of space. It won’t be wasted, and it means you won’t have to leave your guests as you monitor the appetizers. 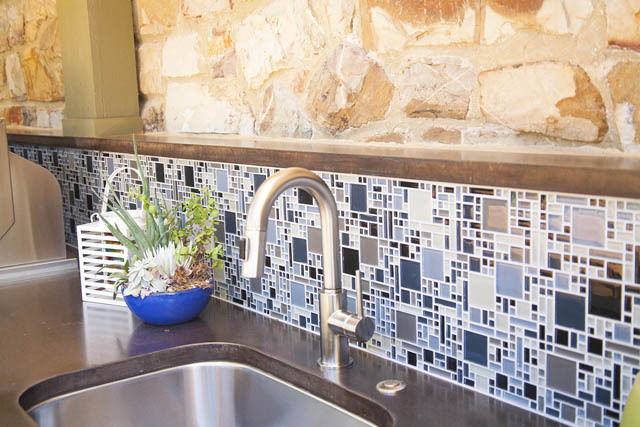 A long table, an ample amount of seating, an expansive counter, and a backsplash add all the indoor elements for your outdoor space. And what about nearby plantings? What should they be? I situated an herb garden just below, and used stacked stone walls of the same rock used in the outdoor rooms. 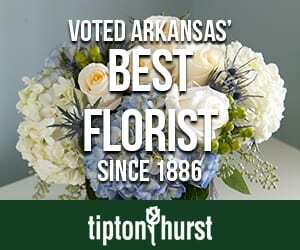 The nice thing about herbs is that they aren’t fussy, and many will scent the air. 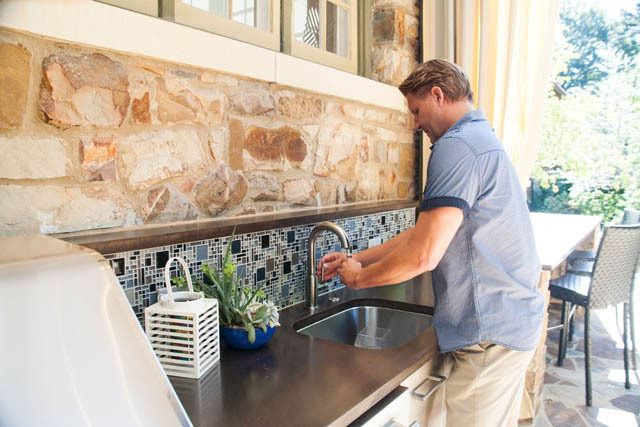 Having herbs near seating and the outdoor kitchen means your guests can smell them close by, and you can stroll over to cut them for use in your dishes. The idea of convenience should never be discounted. We live in a temperate part of the country, so we can take advantage of our weather many months of the year. Use that space between your house and yard! Create new rooms, new vistas! Make use of what you have, and think outside the house. Don’t let something like four walls limit your freedom. 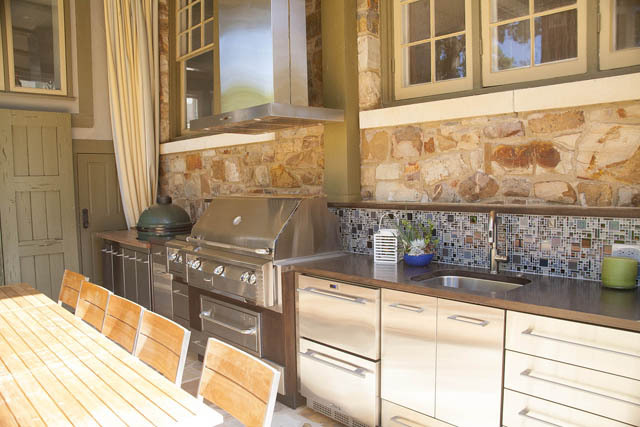 It’s as simple as finding an area that will serve as your gateway to both indoors and out-, then pulling together functional seating and cooking implements, arranging them all, and inviting your guests. If you have just a tiny space between house and lawn, you can use it for great effect. Live Life to the Fullest and never be afraid to try something new! Your home is your oasis! 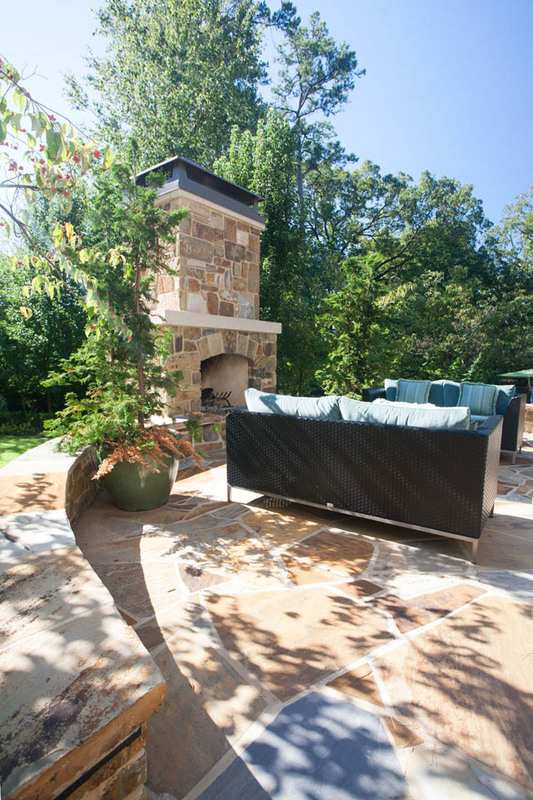 See more of this amazing outdoor space in our March 2014 issue!